Today at Holy Trinity Cathedral His Eminence Archbishop Nikon ordained Deacon Jeffrey Frate to the holy priesthood and Michael Arida to the subdiaconate. Father Jeffrey is a graduate of Holy Cross Greek Orthodox School of Theology, Brookline, Massachusetts and will be attached to the Cathedral. 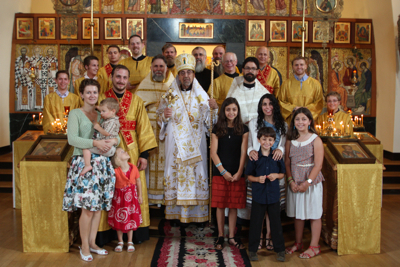 While studying Orthodox theology as an Episcopalian at Holy Cross, Father Jeffrey together with his wife Marissa and their three children Mary, Rebecca and Peter were received into the Orthodox Church at the Cathedral. The Frate family is involved in the Cathedral's St. Herman Church School and in the monthly community dinners hosted by the parish. Father Jeffrey's new ministry to the Cathedral will help to sustain and hopefully expand its liturgical life. He will also be serving when needed within and beyond the Boston deanery. At the end of his last liturgy at the Cathedral, Archbishop Job blessed Michael Arida to wear the sub-diaconal orarion. This last episcopal act of Archbishop Job was in recognition of Michael's love and knowledge of the divine services. Over the years Michael has assisted the locum tenentes of New England along with His Eminence Archbishop Nikon and clergy in and outside of the Boston deanery. Given Michael's love for the services and detailed knowledge of their order and "choreography", Archbishop Nikon decided to formally ordain Michael sub-deacon. Michael attends the Cathedral with his wife Alina and their children Anna and Robert.